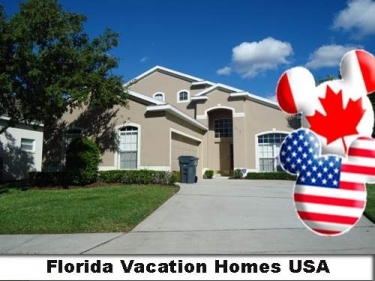 MICKEY'S PARADISE villa is located in Central Florida in the prestigious Hampton Lakes Estate only 15 minutes from the famous Walt Disney World. 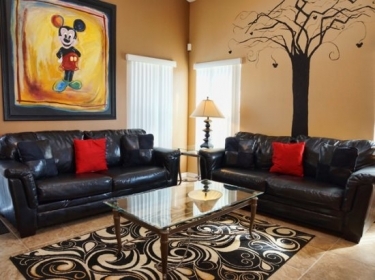 The fully air-conditioned large 2-story villa with 5 bedrooms and 3.5 bathrooms, tastefully decorated throughout with Mickey Mouse decor and a vibrant color theme. With over 2400 sq.ft large families or group will enjoy the space. There are two master bedrooms, one on each floor, with digital-cable TV and private en-suite bathrooms. 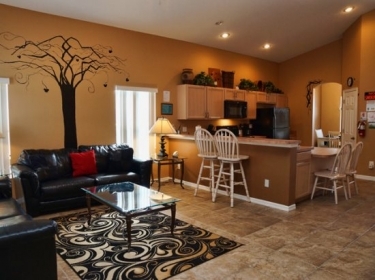 Mickey's Paradise has an open floor plan with high vaulted ceilings giving it a spacious, airy feel. There is lots of space for the family to spread out and for kids to run around. Families love to cook in the fully-equipped kitchen that offers a refrigerator/freezer, stove, microwave and dishwasher, along with all the other kitchen essentials needed to cook a large meal. You can choose to eat your breakfast at the breakfast bar or by the pool. A separate dining area provides a more formal eating area. Upstairs has two twin bedrooms with 3 twins in each. The fifth bedroom upstairs has a lovely queen-sized bed. The upstairs bedrooms share a bathroom. The Reading area is great if you want to sit and relax in your own quiet space and also provides an extra sleeping space for extra people. This games room has something for everyone and will provide hours of fun - who needs the parks! For entertainment all members of your group will enjoy the fun in the fully equipped games room with pool table, air-hockey, Slot Machine and Mutli-Arcade Game. To keep in touch there is free Internet access is available and also free local & long distance calls in the USA, Canada and Mexico. Bring a laptop computer to enjoy the free Wifi. Relax in the tranquil, private pool. The pool has under water lighting for evening swims and the fully-fenced yard gives you the privacy needed. There is also a monitored security alarm system in the home, so you feel your belongings are safe, while you enjoy the day at the park. Start your dream vacation today..........BOOK NOW! 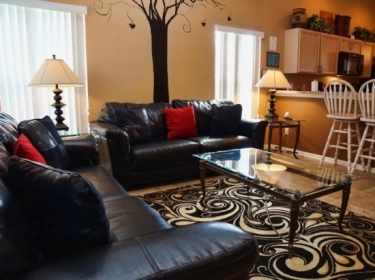 This non-smoking & no pets villa sleeps 14 people. Contact us for SPECIALS, long-term stays, monthly stays and SNOW BIRDS stays.